The Super Eagles began their 2018 World Cup campaign on a poor note, losing 2-0 to Croatia in Kaliningrad on Saturday evening. Oghenekaro Etebo scored at the wrong end of the pitch to give Croatia the advantage, before Luka Modric sealed three points from the spot in the second half. Finally the Super Eagles got their 2018 World Cup participation underway after all the fanfare and excitement that had greeted the team ahead of the competition, chiefly because of their very impressive kits. But as they are aware, those fanfares cease the moment the referee sounds the whistle for the start of the game. And at the start of the game, it was obvious how the Eagles wanted to approach the game – a very cautions system – with the intention to hit on the break. However, the Croats were hardly spectacular in the opening exchanges either, as they seemed content to also play out a cautious game even though they saw more of the ball. The first real chance in the first period didn’t come until the 14th minute, when Mario Mandzukic linked up with Ivan Perisic, who fired just over the bar from the edge of the box. That was about the only real chance for that period, as both sides kept up with the waiting game. And then in the 32nd minute, the Croats struck. A corner from Modric found Mandzukic’s head, and the Juventus star’s header deflected off Etebo past Francis Uzoho for the first goal of the game. Five minutes later, Ivan Rakitic clipped a neat ball into the box towards Andrej Kramaric, whose header from the centre of the box went narrowly over the crossbar and that would be the last real piece of action in that half. 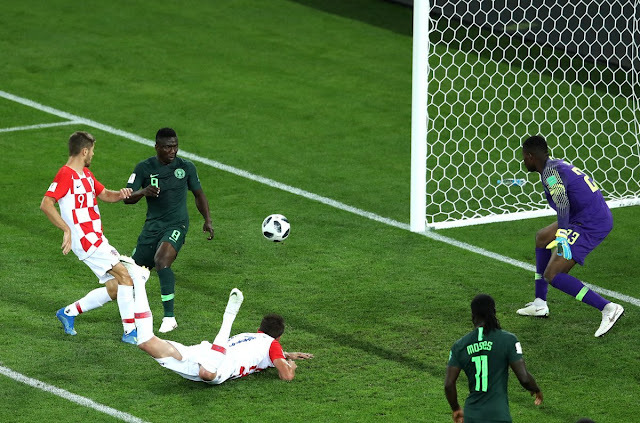 If the start of the first half looked dull and uninspiring, the second appeared worse, but still, the Croats looked more comfortable on the ball with Nigeria comfortable to just hold back and keep their shape. In fact, it was more of a passing game with a handful of half chances here and there until the 70th minute, when the Croats struck again. William Troost-Ekong appeared to have held on to Mandzukic during a corner kick, and referee Sandro Ricci pointed to the spot for a penalty against Nigeria. Modric stepped to send goalkeeper Uzoho the wrong way and doubled their lead. The game appeared won and lost at this point.